Sadly, not Lee Marvin. But I was very,very happy to open the door to the Iceman who did cometh. Our fridge didn’t seem as cold as it ought to have been.And the freezer was icing-up alarmingly.The biggest concern was that the wine took ages to be drinkably cold! Having been ,shall we say, a little ticked off with the payment arrangements of the crew who replaced my oven door (basically, they wanted payment to the workman who was sent to do the job.No invoice, no receipt and no facility for card payment.Do I have feckin’ eejit stamped on my forehead?) * I was not about to hire them. All was well: the seals arrived the day after the holiday and were installed the day after that. Iceman defrosted the iced-up lumps with a dead-handy steamer gizmo. We’ve been having showery weather on and off for weeks.Gardens, of course, are romping away.As are the rotten weeds. But it’s not all bad news! Cursing a particularly tenacious weed and burning from the sun, I called a halt and came indoors for a cold drink and a little blog-reading.First up, Marie, over in Harlem…BINGO! She’s been foraging and look what’s edible! Yes, I’ve had a little nibble of the raw leaves. A bit too fuzzy for my liking, but I’ll definitely make use of it, lightly steamed. How hairy? About the same as older leaves of the herb borage So, if you have Galinsoga taxing your vocabulary, try sending it to the kitchen, not to the inner circle of Hell. 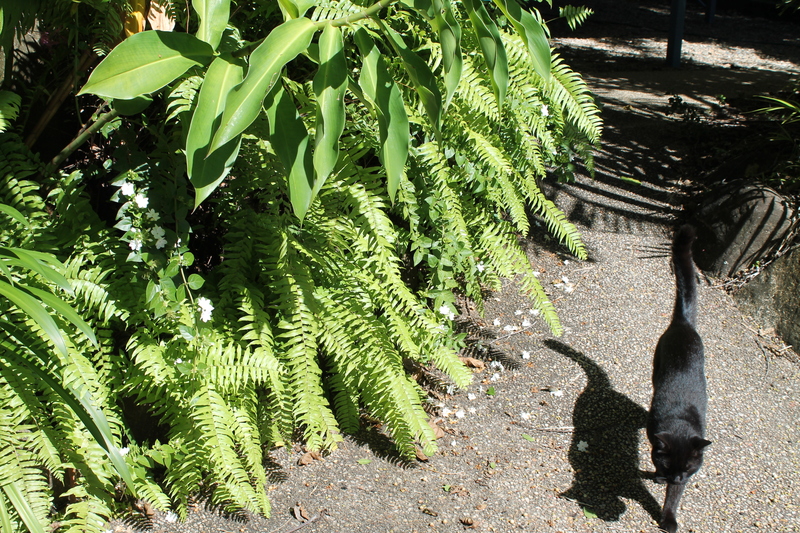 Geiger, being “helpful.” She’d taken a short cut through the ferns and scattered petals all over the path. 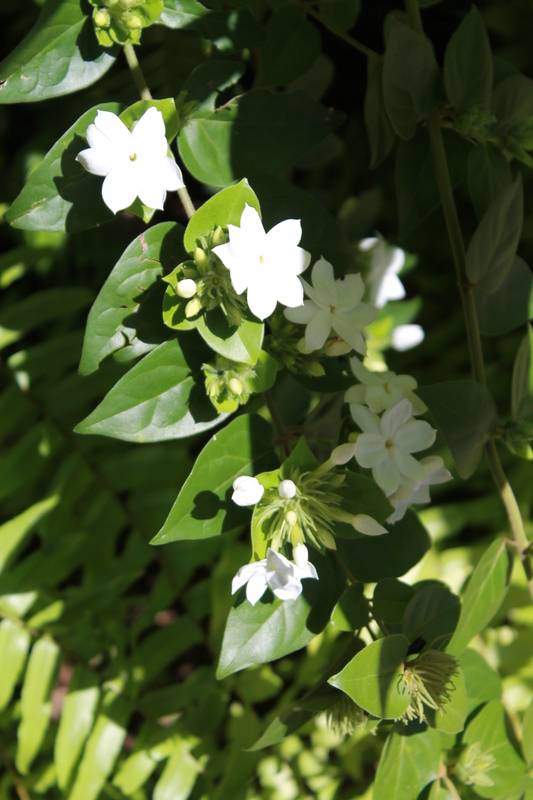 And the jasmine. J.officinale, I believe. It’s Saturday in my world. And that means that in a few hours a happy Band of Brothers Bloggers will be converging on The Zeddary. Unable to make the trip this year, I’ll be drinking thinking of you.Cheers! * I refused to comply with this idea and drove over to their office the following day and paid. ** Not really. I keep pasta in the pantry and linguini-and-tomatoes with salad saw us well-fed. From what I hear, newspaper readers fall squarely into two camps when it comes to the tabloid press: the fors and the againsts. On the for side is the argument that tabloids are easier to fold for reading on public transport. The purists on the other side of the fence (mostly) don’t ride public transport so they pooh-pooh that idea. They also, somewhat sniffily, say that people who buy tabloids can’t read anyway and only look at the nubile nymphettes and the sports pages. My own view? Well, for me, the big boys win, hands-down, every time.You see, those scrappy little chip-wrappers just aren’t big enough when I need to cover my dining table! I now have a routine, after some initial messing about: first, I clear all the accumulated “stuff” from the table. Sometimes, I find things I’d thought lost! Mostly, I find things that should have been dumped! Then I tape several sheets of newspaper over the table. My inking slab is a glass shelf from an old refrigerator. It’s also solid enough to take the (minimal) pressure required for monoprints. I also learned (the hard way!) that it’s a good idea to decant my linseed oil into a plastic squeezy thing. I use one of those bottles that you mix hair dyes in; it has a nice, controllable nozzle so no more big splats of oil gushing out of big bottles! Not very hi-tech, but hey! it works for me! Water hyacinth(Eichornia crassipes) covering much of the surface of the lagoon. I suppose the Council will drag the weed eventually. It’s less a problem on a pond than in streams, but it’s such a rampant spreader it can (and does!) get out of control in some places. Raked off and dried, it’s a wonderful addition to the compost bin. Oh yes…ponies whiched were housed in a field by a river used to graze on the stuff. Probably little nutrient in it, but it did no harm to the horses. I walked to the far end of the boardwalk (which is in desperate need of clearing, fellas!) and managed to pick some for sketching. The yellow is something whose proper name escapes me, but I’ve heard it referred to as a false marigold, also wild mallow and water buttercup. It comes closer to a mallow in flower, though not leaf, so if anyone has a positive ID, please leave a comment.Update 12/9/09 It seems this is a water buttercup, Ranunculus lingua grandiflora. One more pretty picture? Yes? Oh, alright… Kites, hanging at the Lgoons Gallery. These come from Indonesia; toy shops and some of those high-end design stores sell them in flat packs. You slot the light-weight canes into the designated points, attach strings and hang them.